As I mentioned yesterday, I think there's a very good chance we get down to 1289-1295 (depending on whether they can defend the very important 1292.) As oversold as things are getting, I wouldn't even think about going long except, perhaps, to play a bounce -- unless we're able to break out of the acceleration channel on the 60-min chart. 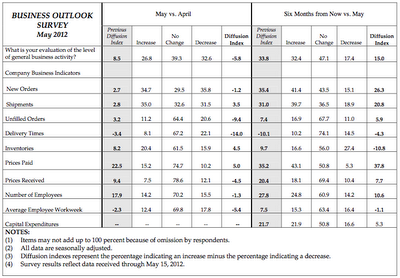 Philly Fed numbers aren't pretty, with a 5.8% drop versus last month's 8.5% increase. 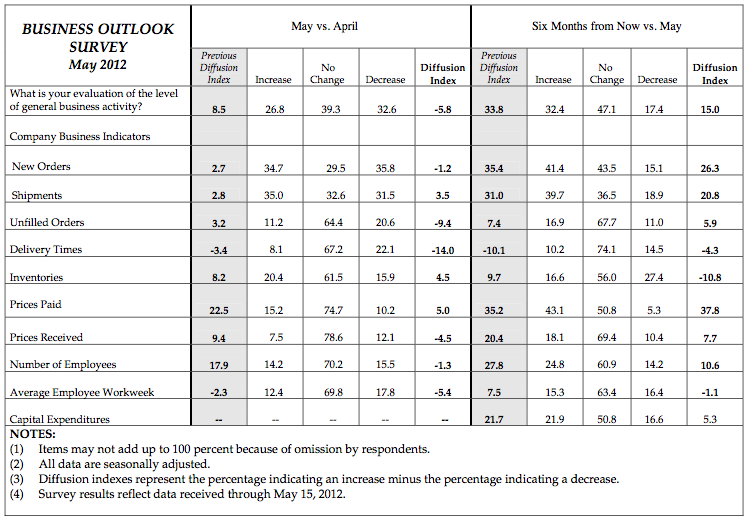 Especially troublesome is the 6-month outlook, which has plunged from 33.8 to 15.0. A negative 5.8% is bad enough in and of itself, but it looks especially ugly compared to consensus: +8.8-10.0%. 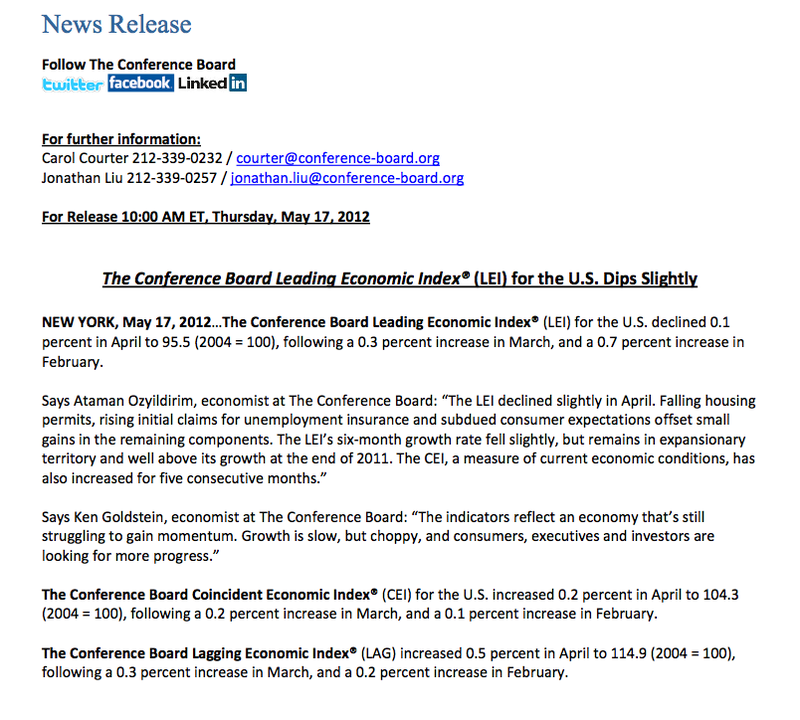 The Conference Board Leading Economic Index also missed, showing a 0.1% decline versus expectations of a 0.2% gain. This is the first drop since last September. I'm watching the RSI for clues as to which of our targets SPX will settle on. 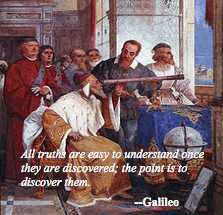 Remember, the range is 1295-1323, though the number of unfolding events that could overwhelm our forecast is growing. The daily chart shows several parallel trend lines that might provide the final stop. But, of course, lower stock prices often occur on a higher low in RSI -- a phenomenon known as positive divergence, and a sign of a potential bottom. The white dashed trend line (7) is next up. It stopped moderate declines in April, September and November of last year and probably corresponds with our 1317-1323 target. 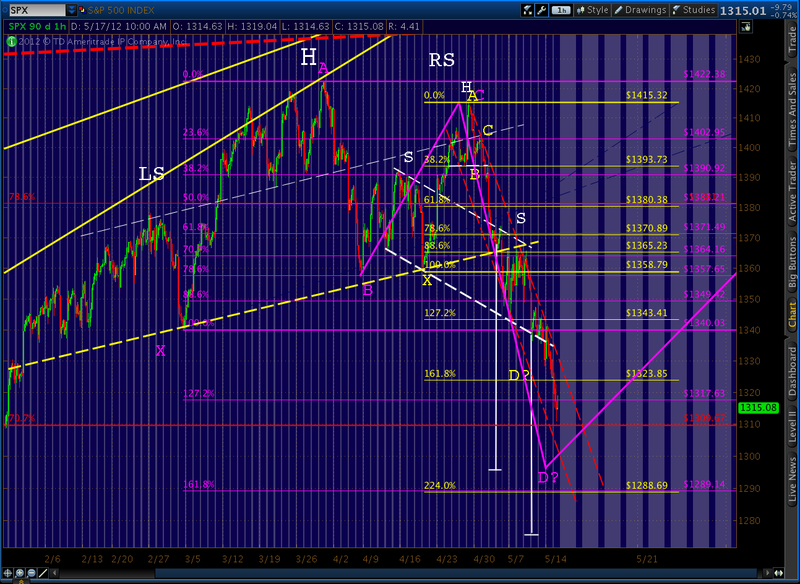 Remember, 1323 is the small (yellow) Crab Pattern's 1.618 and 1317 is the larger (purple) Butterfly's 1.272. The purple dashed line (8) is associated with the declines in November of 2010 and a secondary dip in August 2011 and probably corresponds with either 1300 or 1317 on SPX. The yellow dashed line (9) stopped the plunges in March and June in 2011, and provided the higher low for the actual August 2011 1101 bottom. 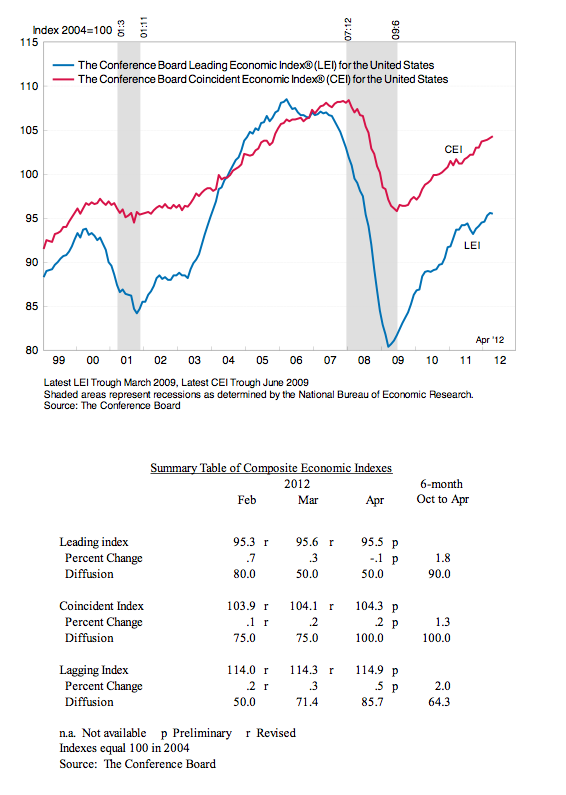 March 2011 is the analogous point in the analog we're watching. Surfing these RSI channel lines is an inexact science, because turns rarely occur exactly in line with previous highs/lows. There's a relatively high margin of error, say 5-8%. So, it's possible that yesterday's RSI low could be considered to have tagged the white line. 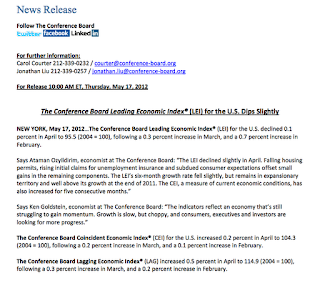 If we get a strong rally off the Philly Fed survey or Conference Board numbers at 10am, we'll call it that way. 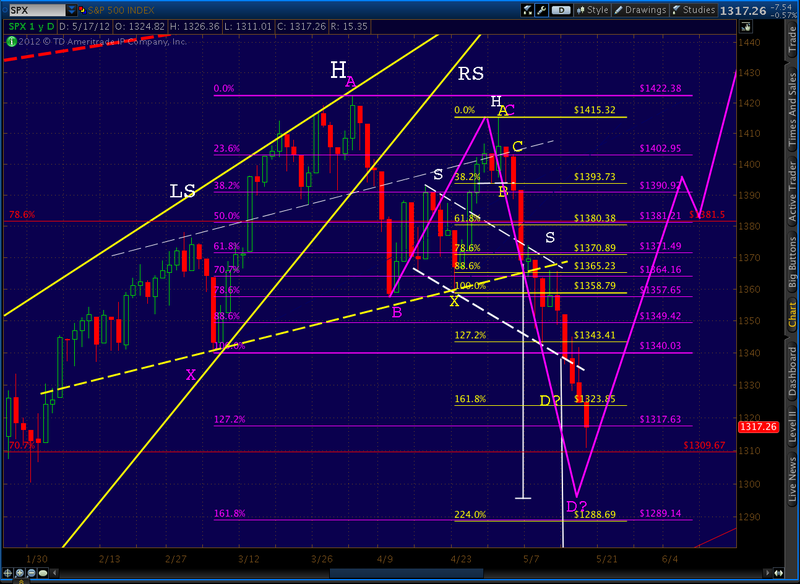 There is one other Fib level we haven't talked about much -- the .707 from the 2007-2009 decline is just ahead at 1309.67. Many investors aren't even aware of the .707, so it's often completely left off charts. 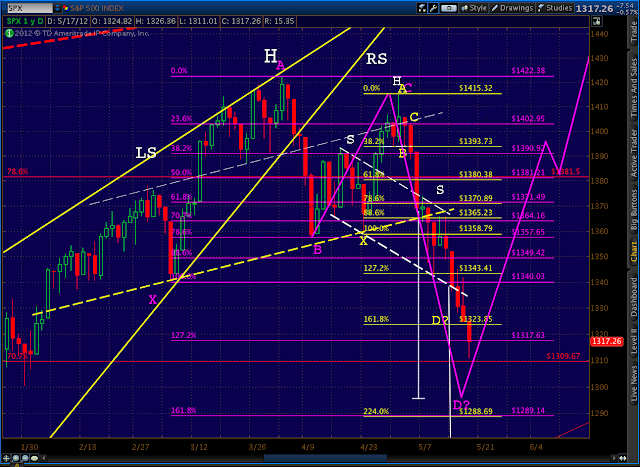 But, this is a long-term pattern, so it could easily come into play. Last, the 60-min RSI shows a pretty good possibility of a bounce in the 1317 range. Between 1323 and 1317, 1317 belongs to the larger and more important pattern -- the Butterfly. So, unless the Philly Fed survey is atrocious, we should get some kind of bounce there.